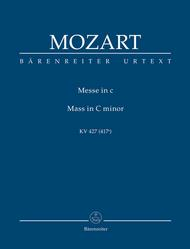 Missa c minor, KV 427 (KV 417a) (Credo and Sanctus reconstructed and completed by Helmut Eder. Erganzende Ausgabe zur Neuen Mozart-Ausgabe). Composed by Wolfgang Amadeus Mozart (1756-1791). Edited by Monika Holl; Karl Kohler. For soprano voice solo, alto voice solo, tenor voice solo, bass voice solo, 2 mixed choirs, orchestra. This edition: Paperback, Urtext edition. Paperback. Barenreiter Study scores. Credo and Sanctus reconstructed and completed by Helmut Eder. Erganzende Ausgabe zur Neuen Mozart-Ausgabe. Level 4. Study score. KV 427 (KV 417a). Published by Baerenreiter Verlag (BA.TP255).ISBN 9790006202232. 22.5 x 16.5 cm inches.